The Royal Air Force Squadronaires new album, 'In The Mood - The Glenn Miller Celebration', has reached No 7 in the UK pop charts, scoring the highest ever album chart position for a military band. The music that the RAF Squadronaires play, Glenn Miller’s Big Band sound, was played to entertain airmen, soldiers and sailors in arguably Britain darkest hour in the Second World War. It is still played today to boost the morale of the current Armed Forces. 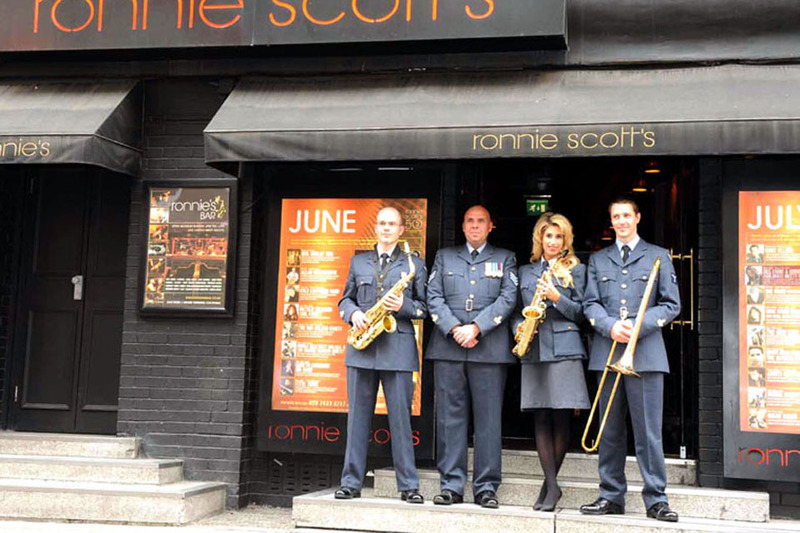 The RAF Squadronaires celebrated the success of their album at the legendary Ronnie Scott’s Jazz Club in London last week. The Big Band performed Miller’s classics including; ‘In The Mood’ and ‘St Louis Blues March’. Decca wanted to do an album to commemorate the 70th Anniversary of the Battle of Britain and thought of the RAF Squadronaires, who did so much for morale during the Second World War. I have been playing with the RAF Squadronaires for sixteen years and they are an institution and part of the Nation’s history. The music of Glenn Miller will never go away, I think that’s why we have been so lucky with the album; the success has exceeded everyone’s expectations. I’ve been in the RAF fourteen years and it’s wonderful to have recognition. We were out in Afghanistan recently entertaining the troops with the Jazz Quintet. Performing out there means a lot to us as it brings entertainment to the troops. They thank us for playing which is really humbling. I’m very excited to be here today, I can’t wait to perform with the whole band live. The first time I was at Ronnie Scott’s I met Michael Bublé and have heard that we knocked Michael off the top of the jazz charts, which is quite exciting; so I think he’d have something to say about that! The music is beautiful, it’s such a lovely, lovely sound. I’ve had such fun working with them. I would love to go out to perform to everyone out serving as I think it’s just as relevant today as it was then. I think for some people today, it will take them back to that place, it will bring back memories; it’s great to be a part of that. I did phone the boss when I found out it was No 7 in the charts and said I’d like a basket of fruit and some sparkling water in our dressing room from now on! At the end of every engagement on the stage, I stand the band up and always say, to the audience; ladies and gentleman it’s a privilege to play the drums with this bunch of musicians, but the honour for me is to stay with the RAF Squadronaires.